I'm back everyone! I've been quite unwell for the last week or so, so I thought we would ease back into this with a nice plain lager. Nothing that should be too stressful on the senses anyway. Red Stripe is Jamaica's best selling lager and is actually famous worldwide. When you think of great beer drinking nations, Jamaica wouldn't come in most peoples top 100! The beer has a reputation for being an easy drinking lager but is probably best known worldwide for being the sponsor of the Jamaican national bobsleigh team, made famous by the movie 'Cool Runnings'. The brewery has also recently made a J$100 million dollar sponsorship of the Jamaican national football team, in any currency thats a lot of beers sold! Any brewery that can sell that many beers has to have something going for it. Hardly unexpectedly Red Stripe pours like your standard lager. It pours a clear golden colour with mountains of bubbles rising to a 2 finger white bubbly head. The head is a little airy perhaps but the retention is fantastic and it laces the glass really well. I'm really impressed with the look of this lager, it's close to perfect! Cheaper lagers often smell really quite nasty, while the Jamaican lager is by no means a great smelling beer it's not nasty, which for me is the main thing with these tropical beers. The nose has slightly sweet smelling malts and some spicy herbal hops. There is a mild corn smell, not hugely dissimilar to a bag of corn chips, this is not to be unexpected from an adjunct lager as corn is often used in adjunct lagers. It's a reasonable smelling lager. This is a actually a surprisingly good lager! There is a mild grain flavour as well as an unusually corny flavour. There is a slight sweetness to the pale malts, but there is a spicy hop bitterness about the whole beer. It's actually a delicious beer, it finishes with a slightly metallic tinge in addition to the fantastic bitterness. 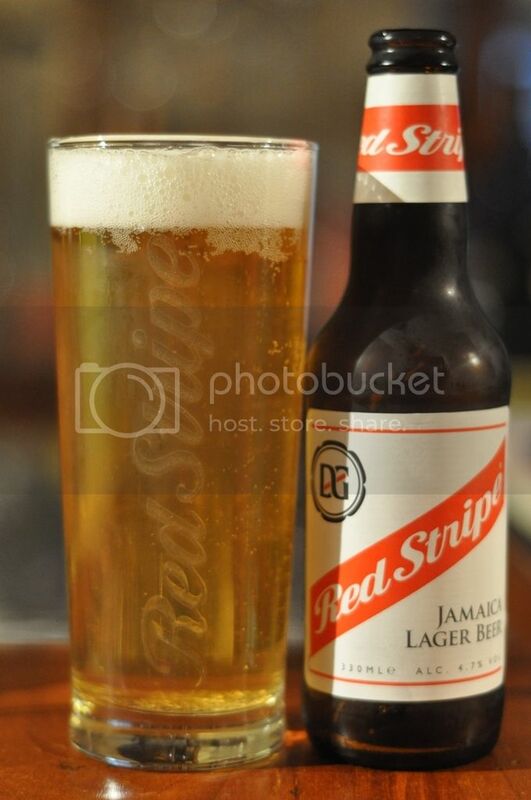 Red Stripe Jamaican Lager is one of the more refreshing lagers I've had. It's everything you would want in a tropical lager, crisp, wet and relatively light in flavour. This would make a fantastic session beer, due to the moderately low carbonation and excellent drinkability. At the very low price this beer is currently sold at I think you should be going out to get some, it won't disappoint if you go in with an open mind. By no means is it a world class lager, but it's a damn good thirst quencher!